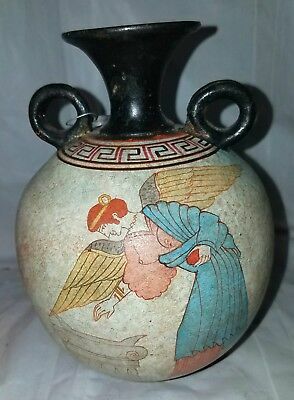 Seller: ww2dogs (5,681) 99.8%, Location: Maynardville, Tennessee, Ships to: US & many other countries, Item: 312066776875 This item is a well done reproduction of an ancient Grecian attic black amphora. It is signed on the base (see images). It also has a round lead tag found on quality reproductions of ancient Grecian pottery. This amphora stands 6" inches high. It is in good condition with no cracks, chips, or discoloration. The buyer pays $9.98 for US Mail shipping. Thank you for your interest in this amphora, ww2dogs. Popularity - 321 views, 0.7 views per day, 437 days on eBay. Super high amount of views. 1 sold, 0 available. 321 views, 0.7 views per day, 437 days on eBay. Super high amount of views. 1 sold, 0 available. Seller - 5,681+ items sold. 0.2% negative feedback. Great seller with very good positive feedback and over 50 ratings. 5,681+ items sold. 0.2% negative feedback. Great seller with very good positive feedback and over 50 ratings.